Located in the heart of Grand Forks, this hotel is within 1 mi (2 km) of Columbia Center and Columbia Mall. Alerus Center is 2 mi (3.2 km) away. Very good value for the price we paid. Happy with the washer & dryer in the hotel. We were able to wash clothes after being on the road for a few days. Friendly staff. Free breakfast is always wonderful. Will be happy to come stay here again. 😀😀😀😀😀⭐⭐⭐⭐⭐ Love the free bottles of water we get when checking in! The lady blackjack dealer shouldn't be so quiet and have an unhappy look on her face. Other than that, the staff, the pool, the pizza etc was all great!!! 4 years in a row we've stayed and are impressed! 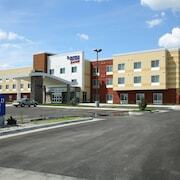 Where to find East Grand Forks hotels near an airport? Where can I find hotels in East Grand Forks that are near tourist attractions? Are you wanting to book a hotel or apartment in the heart of East Grand Forks? 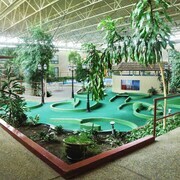 East Grand Forks has 3 hotels within a 0.1-kilometre (0.06-mile) distance of the town center. 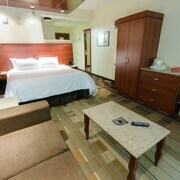 There are some hotels within driving distance, including the East Grand Inn and Fairfield Inn & Suites East Grand Forks. 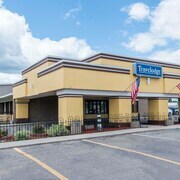 The Holiday Inn Express Hotel & Suites Grand Forks is located 14 kilometres (9 miles) from the center of East Grand Forks. 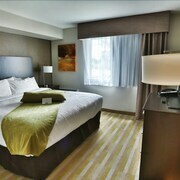 Or, alternatively, the C'mon Inn Hotel & Suites is located 13 kilometres (8 miles) away. Other alternatives here include the Hilton Garden Inn- Grand Forks/UND and the SpringHill Suites by Marriott Grand Forks. Before you say goodbye to Thief River Falls, ensure you catch some local sport. Visit Alerus Center to the southwest of East Grand Forks. If you are keen on booking a bed close by, make a reservation in the Staybridge Suites Grand Forks or Country Inn Suites Grand Forks. Our destination page is an excellent way to learn more about East Grand Forks. What are the most popular East Grand Forks hotels? Are there hotels in other cities near East Grand Forks? 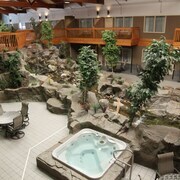 What other types of accommodations are available in East Grand Forks? Explore East Grand Forks with Expedia.ca’s Travel Guides to find the best flights, cars, holiday packages and more!